Most sunscreens contain toxic ingredients or endocrine disrupting chemicals that in many cases may actually promote skin cancer growth and free radical production in the body. In fact, in the years since sunscreen use began, skin cancer rates have actually risen, and a 2007 document from the FDA stated that: “The FDA is not aware of data demonstrating that sunscreen use alone helps prevent skin cancer” In fact, many reports show that most sunscreens actually raise skin cancer risk. 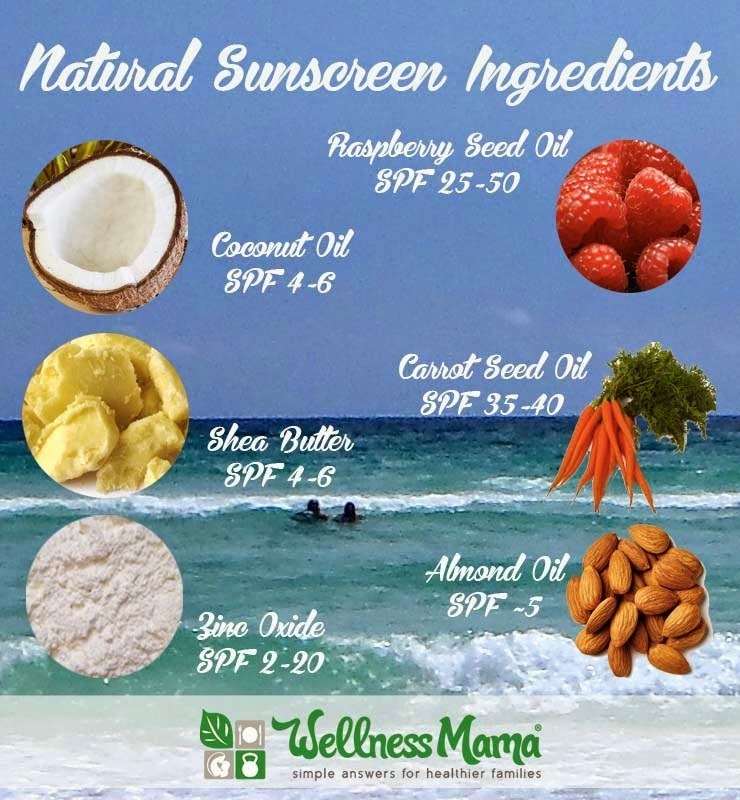 Even natural, commercially available sunscreens often have toxic ingredients! Check out your brand here! Considering many people these days are actually Vitamin D deficient, I consider lack of sun exposure to be a much bigger problem than too much exposure. Vitamin D deficiency has been linked to many types of cancers including the most deadly types of breast cancer. Lack of Vitamin D has also been linked to problems during pregnancy including pre-eclampsia, gestational diabetes, premature labor, and more. As a society, we’ve literally cut off our nose to spite our face when it comes to sun exposure. To avoid skin cancer, we’ve shunned the sun and the Vitamin D our bodies produce with sun exposure. On top of that, sun exposure itself is not the only factor linked to skin cancer, and many other factors, such as Omega-6 Vegetable Oil consumption can have a big impact on skin health! In most cases, my approach to sun exposure is to get adequate daily exposure, without getting close to the point of burning. Since most of us don’t work outside these days, it actually takes effort to get daily sun, rather than to avoid it. In the event that I’m going to be out in the sun for much longer than my skin is used to, it is often easy enough to just put on a hat or shirt to shield my skin. If none of these options are available, for instance, on a day at the beach in early summer before I’ve been in the sun much, I will very occasionally use natural sunscreen. 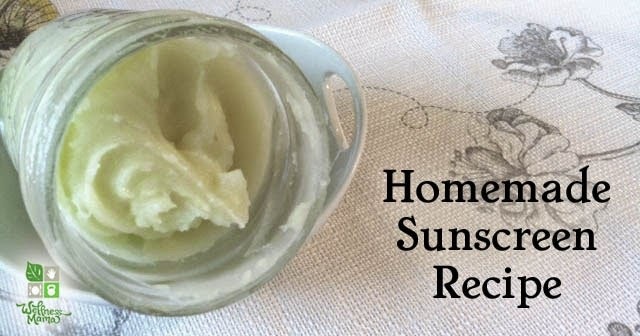 I’m yet to use it this year, and hope not to at all, but I wanted to share my recipe so that if you are in the sun for extended periods of time this summer, you have a natural option. This would also be a more natural alternative for really young children, those taking medication that increases sun burn risk, or those who burn very easily. Just to clarify, even though this natural sunscreen smells great and is naturally moisturizing, I don’t recommend using it daily since the Vitamin D you get from the sun will be more beneficial in the long run! The final version will have a varied sun protective ability depending on the amount of each ingredient used. For a simple version, even just coconut oil and shea butter with a little Raspberry Seed and Carrot Seed Oil or some Zinc oxide will work for moderate exposure. As always check with your doctor or dermatologist before using any new products. NOTE: This is an improved recipe since many people were having trouble getting the temperatures exactly right to get the lotion to emulsify (as per the comments below). This recipe will not have any of those issues! Combine ingredients except zinc oxide in a pint sized or larger glass jar. I have a mason jar that I keep just for making lotions and lotion bars, or you can even reuse a glass jar from pickles, olives, or other foods. As the water heats, the ingredients in the jar will start to melt. Shake or stir occasionally to incorporate. When all ingredients are completely melted, add the zinc oxide, stir in well and pour into whatever jar or tin you will use for storage. Small mason jars (pint size) are great for this. It will not pump well in a lotion pump! Use as you would regular sunscreen. Best if used within six months. Make sure not to inhale the Zinc Oxide- use a mask if necessary!